Check out my X-ray. Check it out! Not only do I have what looks like a couple of nails and a cable-tie in embedded in my elbow, making me totally and undeniably bionic (something that I used to claim at school, circa 1977, at the height of my titanic Jaime Sommers girl crush), but also quite clearly I have a fire extinguisher and set of double doors lodged in there too. Brilliant. 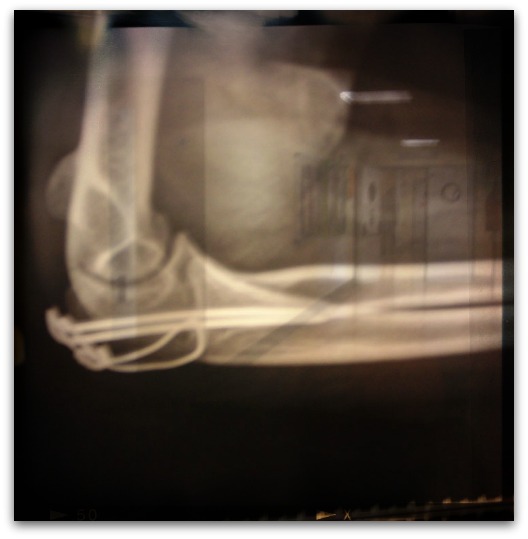 I won’t lie, following today’s follow-up X-ray, je suis just a little bit choqué at the amount of hardware in my arm, but it is healing correctly and I am out of the blessed cabestrillo. All that remains now is the little matter of getting full mobility back. Oh, and the big question… will I ever dance again? I won’t muddy this otherwise fantastic post with grumbles about waiting rooms, harassed nurses and the general challenges facing expats when negotiating the Spanish health system. Perhaps that is a post for another day when I am feeling grumpy. No, today I am feeling positively, bionically bright and bouncy about my arm, so I will leave it there. For a before photo click here. Not for the faint-hearted. I have linked this up with #SocialPix over at Love All Blogs because I am just so effing thrilled by it. Click the link to see what other cool images people are loving this week.